Granger Construction completed 320,000 SF of new classrooms, administrative offices, a media center and an athletic wing attached to the existing cafeteria and performing arts center, both of which were completely renovated and updated during short summer blitz projects. During pre-construction, Granger identified project savings so the existing cafeteria was renovated to create a multi-use room. The cafeteria was temporarily relocated into the new high school so work could take place during normal operations. The roof structure was removed and replaced with a vaulted “barrel shape” truss to create the new 15,000 SF space. This renovation provided seating for 600 students during lunch, offered a new community meeting space and created a new feel for off-hour collaboration for students. The parking lots, site utilities and athletic fields were completely reconstructed, including baseball/softball fields, tennis courts and football stadium. Removed existing football stadium including grandstands, track and field; installed synthetic turf with under drains, new asphalt running track, new home grandstand and upgraded visitor stands. 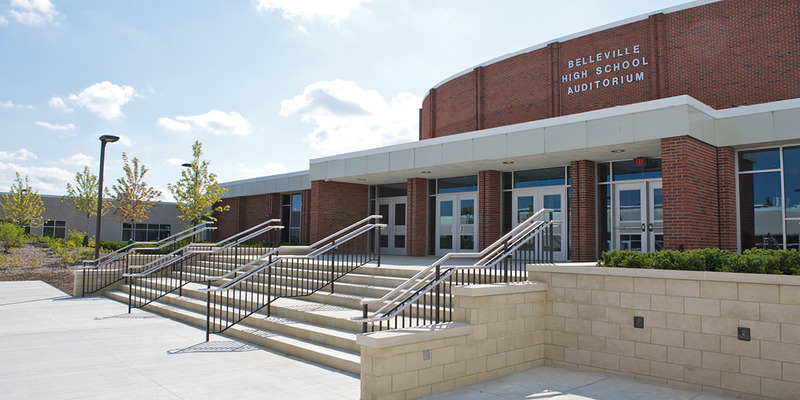 The entire project’s additions and renovations were completed in 24 months, a full year ahead of schedule, while maintaining a fully functioning high school campus for 1,800 students.